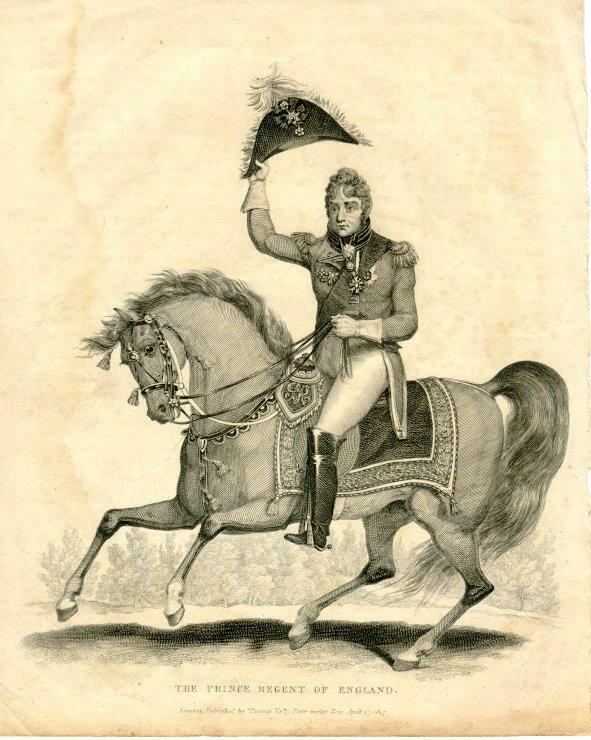 The Prince Regent of England, 1815: The Prince Regent, who later became King George IV, on horseback. This is a half length portrait of George IV wearing a black coat with fur trimming, a medal and the Garter Star. He is sitting on a red couch with a black case and papers beside him. a) PRINCE OF WALES: George, Prince of Wales (or ‘Prinny’), was born at St James’s Palace on 12 August 1762, the eldest son of King George III. He grew to be a cultural and artistic man, the leader of fashionable society, and his patronage of Brighton in the late eighteenth and early nineteenth centuries did much to ensure the town’s success. He was also, however, headstrong and disrespectful, prone to lying and keeping bad company, a drinker and gambler, and he ran up large debts much to his father’s dismay. b) EARLY VISITS TO BRIGHTON: The Prince’s first visit to the town was on 7 September 1783 to visit his uncle, the Duke of Cumberland, at Grove House. It was the Duke’s marriage to an Irish widow in 1771 which led to the 1772 Royal Marriage Act, and the feud between the Duke and his brother the King appeared to encourage a rebellious attitude in the young Prince of Wales. The first royal visitor to the town (apart from Charles II, q.v.) was the Duke of Gloucester on 11 July 1765, and he was followed by the Duke of York in August 1766, and by the Duke of Cumberland. Brighton townsfolk were therefore accustomed to the visits of royalty, but were naturally excited at the prospect of receiving the heir to the throne. A salute was fired from the battery (which unfortunately killed the gunner), and in the evening the Prince promenaded on the Steine , which was illuminated for the occasion, to watch a firework display. The following day he rode out with stag hounds, attended a ball at the Castle Inn in the evening. and later in his visit attended a performance at the theatre in North Street . Staying for a total of eleven days, the Prince declared himself highly delighted with the little town. His second visit commenced on 23 July 1784 on the advice of his physicians, possibly for the sea-water cure as he had swollen throat glands. George stayed for ten weeks, again staying at Grove House, but there was considerable criticism in the town over his choice of disreputable companions. His third visit was in the following season, June 1785.
c) MARRIAGE TO MRS FITZHERBERT: Maria Anne Smythe was born on 26 July 1756 at Bramsbridge, Hampshire. A devout Roman Catholic, she married Edmund Weld at the age of eighteen, but was widowed within a year; she then married Thomas Fitzherbert who died of a chill three years later. Twice-widowed but still young, Mrs Fitzherbert now had a modest fortune of her own and took up residence at Richmond Hill near London. The Prince of Wales is said to have first met her at the opera and was immediately smitten, but he knew that marriage was impossible because of her Catholic faith. Mrs Fitzherbert then went abroad for some time, but the Prince continued to pursue her, and on her return from France she agreed to marriage with a secret but illegal wedding service being held on 15 December 1785 at her home in Park Street, London. (It was illegal due to the Royal Marriage Act of 1772 which forbade unapproved marriages by members of the Royal Family.) Following the wedding, Maria first came to Brighton in July 1786 and probably stayed at Marlborough Row; the Prince had arrived two weeks earlier and was probably staying at Thomas Kemp’s farmhouse on the Steine . The couple were popular visitors to the town over the next few years, but they never stayed in the same house. Later in 1786 Louis Weltje obtained a lease on Kemp’s house on behalf of the Prince, and it was subsequently replaced by the Marine Pavilion which was ready for occupation by the summer of 1787 (see ” Royal Pavilion “). This has really helped me on my History coursework, thank you. Yes, this has also helped me with my course work. 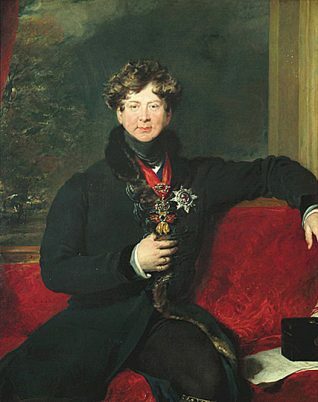 I was assigned to write about the Prince Regent and the Pavillion. It’s really quite useful this information and will be incorporating it into my essay. (NOT copying and pasting). I will put it in my own words, I wont steal work from other websites and call it my own, that’s complete fraudulence unless you actually reference the website. Like in my IT class we had to copy and paste some information but we must reference it otherwise we would be in trouble. Like music, if your going to download it from the internet you must actually buy it. In this aspect actually, it’s quite important to read the terms & conditions. It will mainly say about not sending your download to other people, because the music company you actually bought it off aren’t making any money that way. It’s quite a bad thing to do. In my opinion I also hate how pupils around me copy and paste work off other websites and call it their own, when it sounds really well spoken, including complex vocabulary, when they get a top grade. When sometimes I put my hardest work into my coursework (not copying and pasting) and don’t get as good a grade as them when they have, in technical terms, cheated. Yes this has helped me too on my work. It took me a while to find what I was looking for but I have found it. Thank you very much-I will be using this website again.